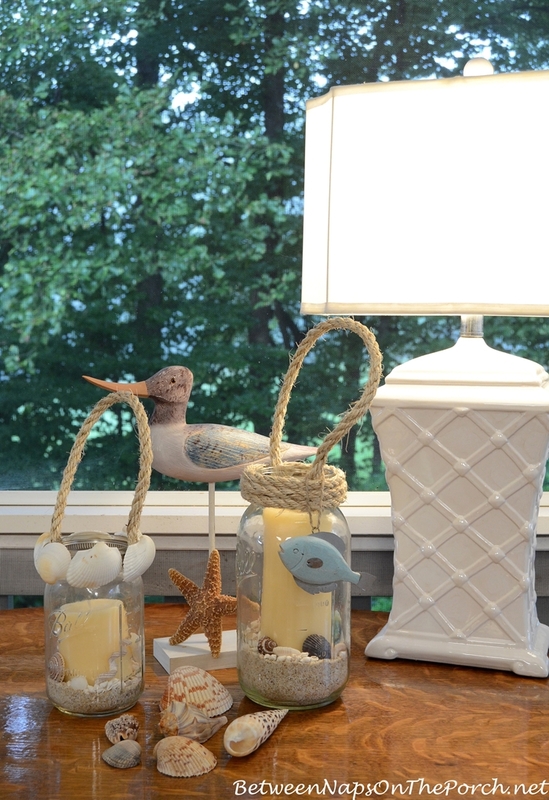 Recently, I came across a photo in a poplar store catalog featuring some pretty candle lanterns. I loved the lanterns, especially the handy rope handle, so I decided to make my own but with a few changes. 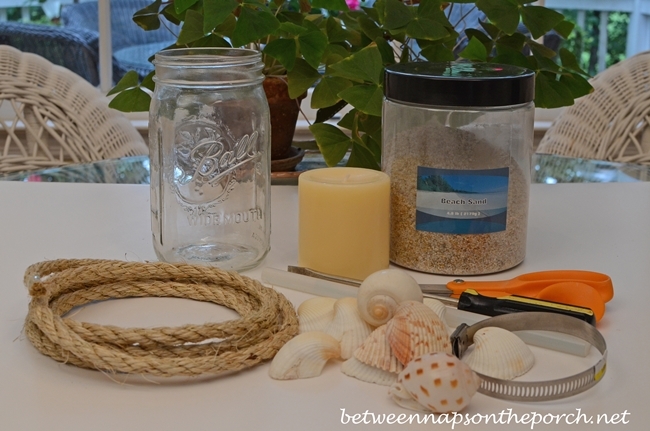 The supplies needed for this project were: a 1 1/2 pint size, wide-mouth jar and a 1/2 gallon jar (Ball canning jars work great), candles, sand, hose clamps, rope, shells, glue gun, scissors, and a flat-head screw driver. I found the canning jars and hose clamps at my local True Value. They also have rope but I didn’t need to purchase any since I already had some at home. 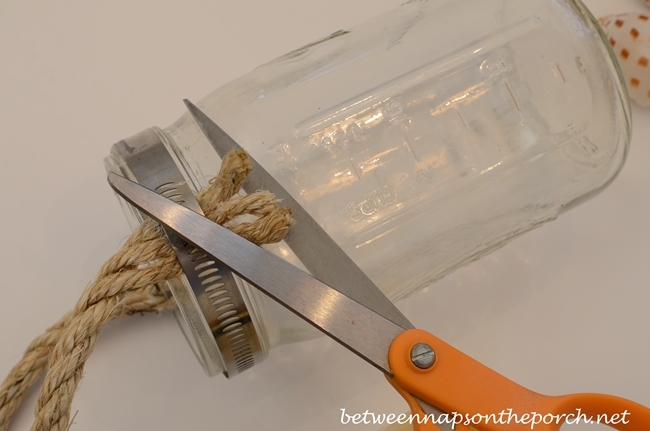 To begin, I cut a piece of rope around 16 inches long and hot-glued it to one side of of the jar. 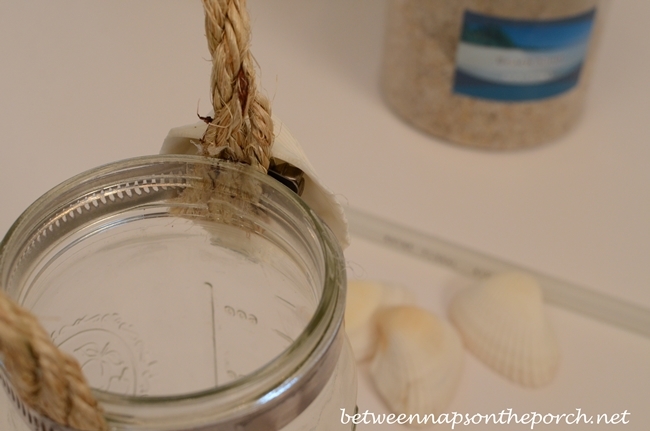 I hot-glued the other end of the rope to the other side of the jar. 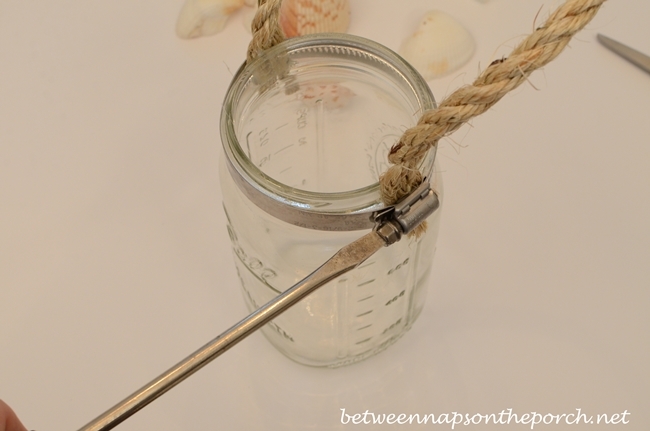 On both sides, I unwound the edge of the rope so I could press all the little sections up against the jar to glue it securely. 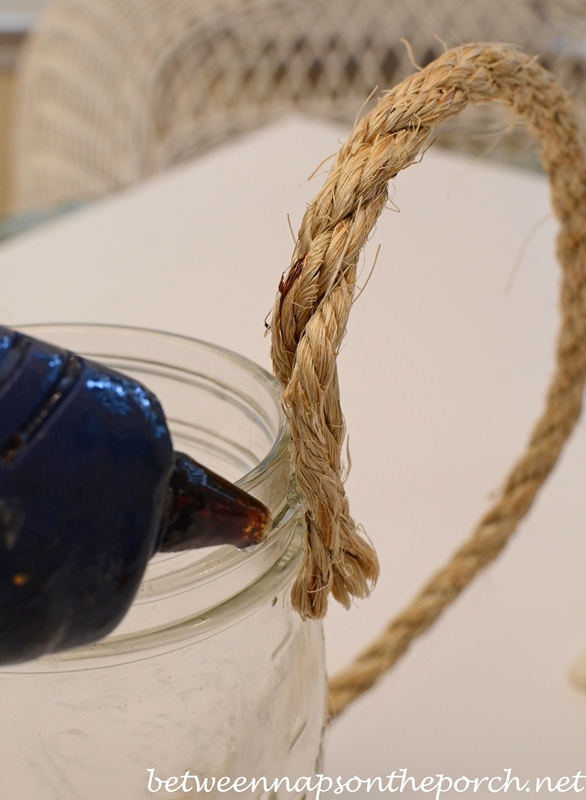 Once the hot glue was dry, I slid the hose clamp down over the rope handle, down around the rim of the jar. The jar I used was a 1 1/2 pint, wide-mouth jar. Hose clamps come in lots of sizes. The one that worked for my jar was around 3 1/2 inches in diameter when fully opened up. Using my screw driver, I tightened down the hose clamp, nice and tight. I trimmed off the extra rope that was sticking out from under the hose clamp on both sides of the jar. I hot-glued a shell over the top of the hose clamp adjusting screw. In this photo, you can just barely see the adjusting screw hiding there under the shell. A deep shell works best for hiding the screw. 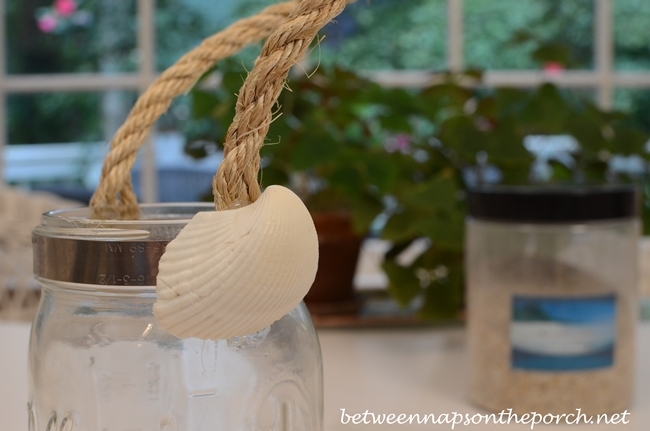 I glued a second shell over the area where the rope attached to the jar on the other side, too. I had planned to leave the jar this way, but then had a better idea. 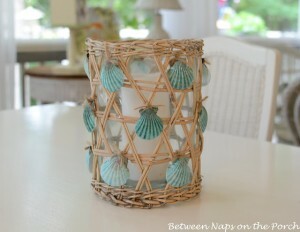 I decided to decorate the whole rim of the jar with shells…liked that look much better. 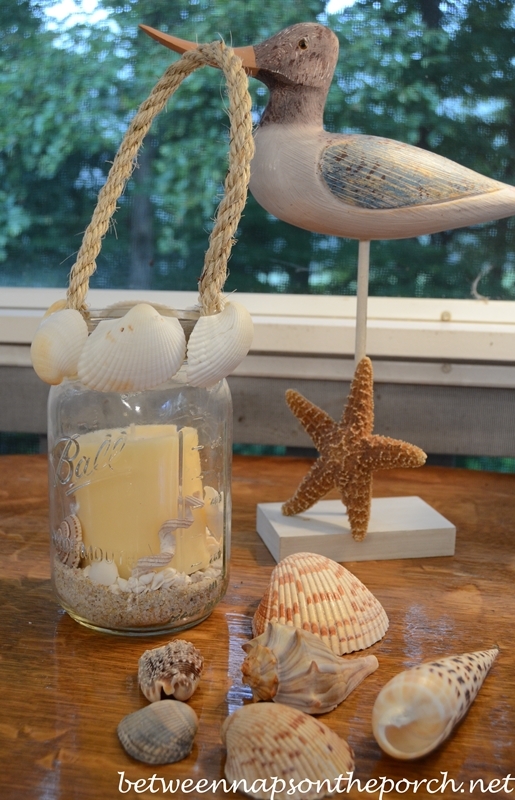 Finally, I filled the jar with some beach sand found in a local discount store, inserted my candle along with a few small shells and my lantern was complete. As I looked at my lantern, another little idea popped into my head. I decided to make a second lantern and it turned out to be my favorite. 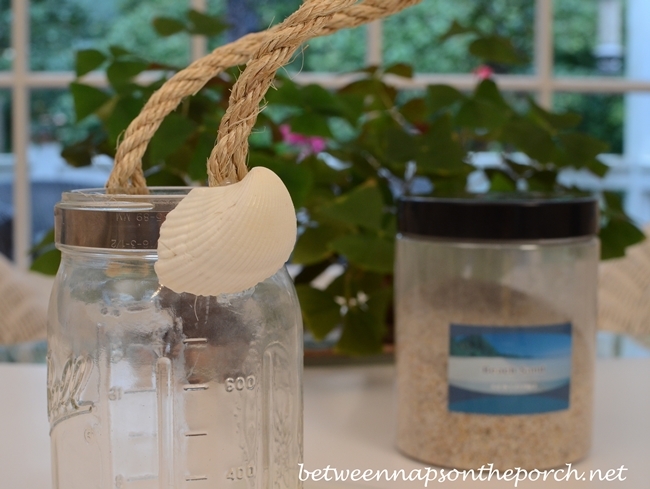 Again, following the steps at the top of this post, I attached a rope handle (around 18 inches long) with hot glue and a hose clamp to the top of a 1/2 gallon Ball mason jar. After securing the rope handle and the hose clamp as detailed in this post above, I began hot gluing the rope around the top rim of the jar. 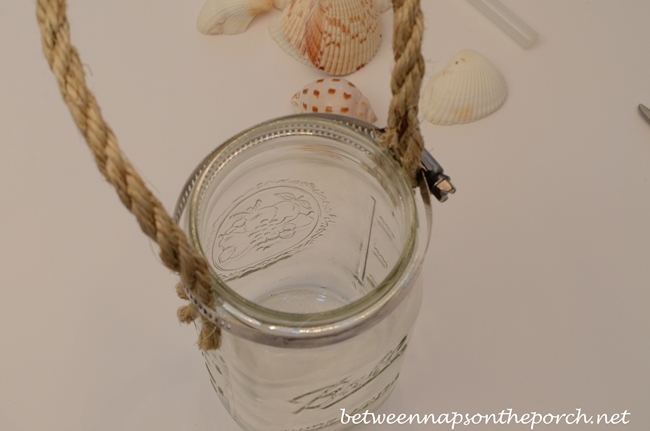 As I attached the rope, I turned the jar around and around, covering the whole rim of the jar as I went. Eventually, the entire hose clamp was hidden by rope. Now all it needed was a bit of sand, a candle and a few shells. 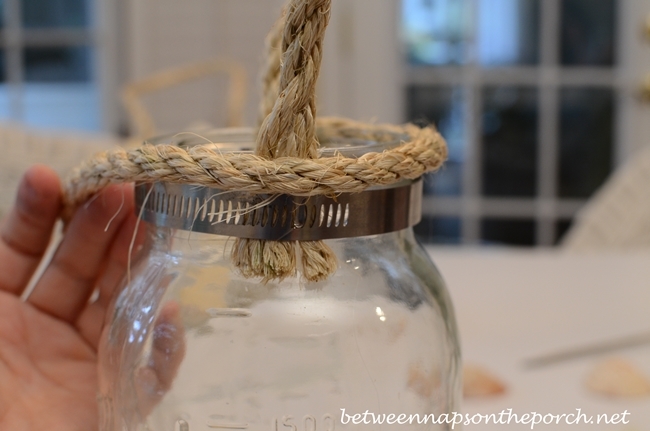 Once you have your rope handle secured with hot glue and a hose clamp, decorate the rim of the jar, or the jar itself, in any way you wish. Just make sure your decorations are not near the flame of the candle once it is lit. Let your imagination run free when making these. I added a decorative fish I’ve had for many years to the larger lantern. These were so easy to make! 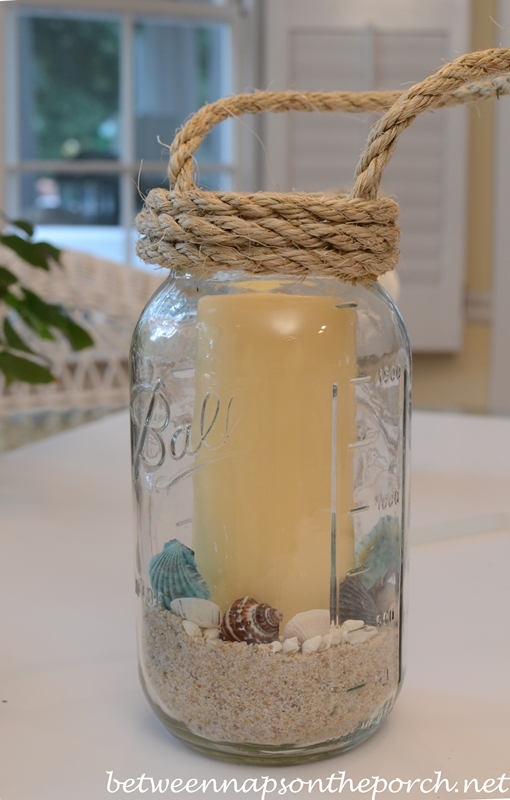 I have a feeling you may be seeing these in a beach themed table setting sometime soon! 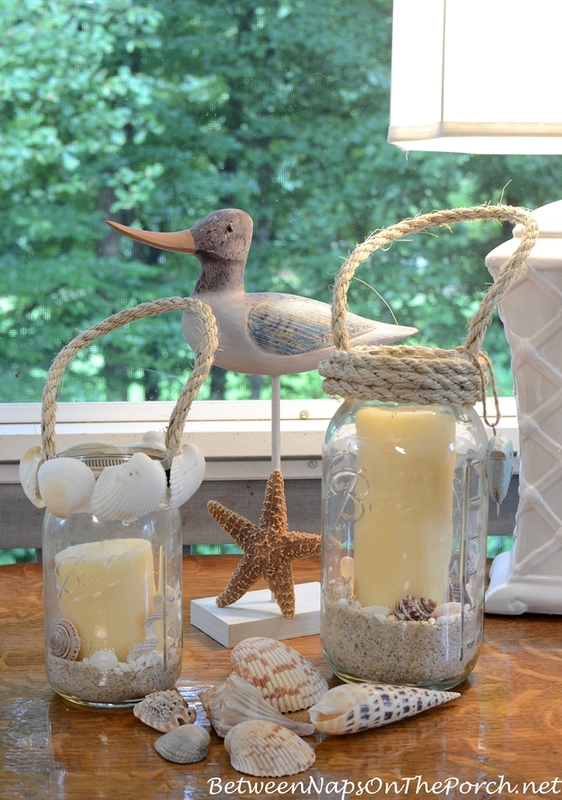 If you love mason jar projects as much as I do, be sure to check out True Value’s “Mad About Mason Jars” board on Pinterest. I live for your posts! You are sooooooooo creative and I LOVE how you express yourself. You are awesome………..Keep up the good work!! Now these are just adorable! I would never have thought to use the hose clamps! Going to check out more projects on True Value’s Pinterest board. Thanks, Jane! They have some cute projects on their board. 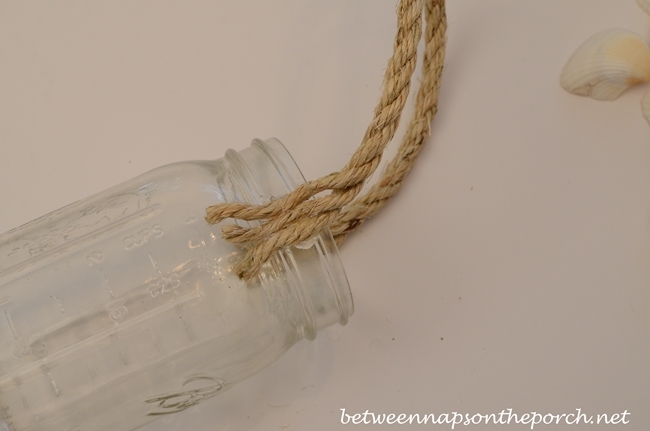 Amazing all the things you can do with a Mason jar! lol For a little while anyway. They were back out today replacing the pieces that have nutsedge! Hi, Thanks so much for this tutorial. Your details were great and easy to follow. I am thinking these would be awesome for my grandson’s rehearsal dinner. They are going to do a low country boil and this is perfect. They would be perfect for a low country boil…fun! CLEVER and crafty and super cute, Susan- well done! Your beachy sea tablescapes are always so awesome, can’t wait. These are great looking. Think I might create some Halloween ones to line my steps this year. Sandi, Yep, I was thinking about that, even bought some black candles with that in mind. The rope in a darker brown or black would be perfect for Halloween. LOVE the idea. 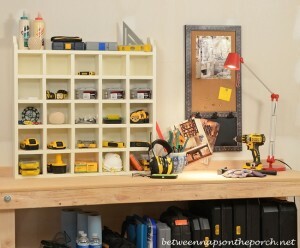 I need to buy the clamps and make one. Good job! My favorite is the 2nd one, but both are very creative. 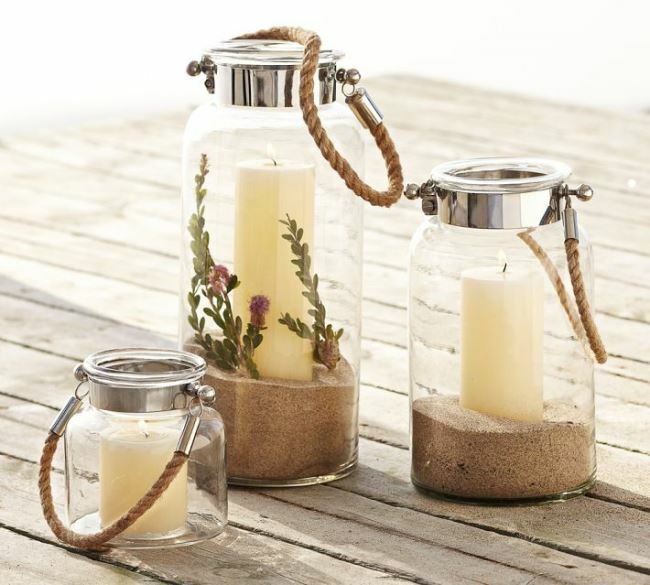 I have the jars…I have the rope…I have the glue gun, shells and candles…all I need are the hose clamps! Next time I have to run into town I will have hose clamps on my shopping list! Thank you, Susan! Susan, they are so cute would look lovely in my seaside gazebo. I have made similar ones for Christmas parties, with gold stars and used wire. A question for you, you said you hot glued everything what about the Fabri-tac you bought not so long ago. I too bought it and wondered if that would work on glass? It says it works on other things than fabric, I used it on a torn gift bag and it worked great. I love it and can’t wait to make one. Very cute, thanks for sharing your ideas with us. I always burn my fingers when I use a glue gum ARG!!! They are just great…I find myself drawn to nautical again…when I moved to the shore I had it everywhere..got old really fast…seems nautical has come a long way in décor since the late 70’s…if I had to describe my look it would be…shabby chic washed over Nantucket…I really appreciate the simplicity of these…Thanks for the great idea……hope you’re weekend is going well..rain. ?..we had some last night..just ugly so far today..yuck.!! These are so adorable. I love anything beachy. When you live in the desert you have to dream! Think you’ll have started all of us off on making these awesome lanterns. Quick, versatile and inexpensive. 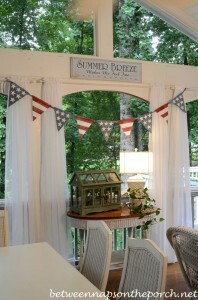 Can make these any way a person can think of all year long, great project and decorating addition. Loving it so much. Great work gal. Your lanterns are so great looking. Hm, wonder if hubs has some clamps in his tool box. Will have to ask him. Yes girl, I am sure you will be seeing these everywhere on Blogville. Since I have jars galore left from my Daughters wedding, just need a couple of things I will be set. Your yard is really looking nice! You are always surprising me with all your crafts & table settings. Can you teach a time management class? 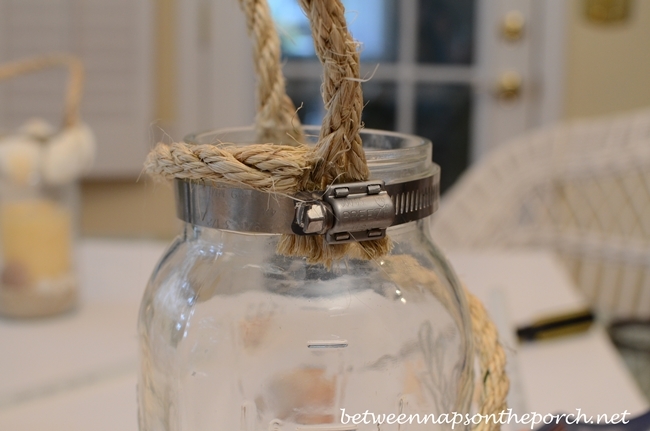 I love what you did with the mason jars, the hose clamp is such a great idea to keep the rope secure. Love your posts and I love True Value stores. 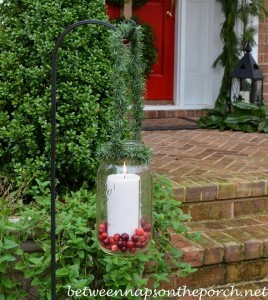 Great way to use those canning jars I never seem to get time to use! These are so clever!! What a great idea! 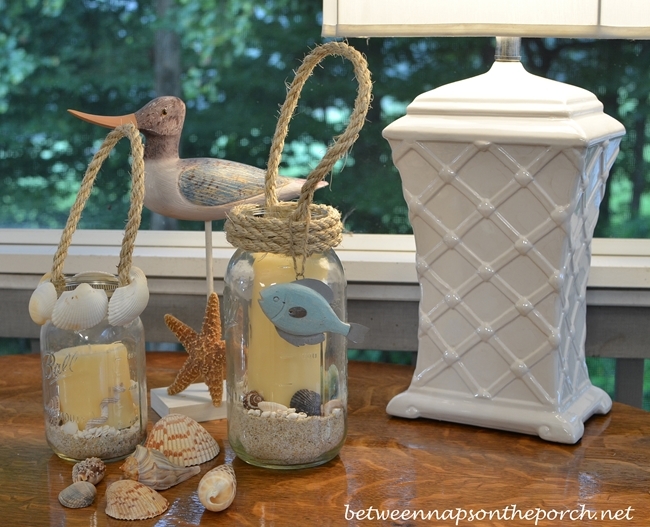 Susan…the lanterns are so beautiful and practical…a great project that I can do with my granddaughter to make a great gift for her parents…She loves making gift for them!…and how fabulous they are for hanging…Thanks for this great project Susan! Have a wonderful week!! very cool idea! thanks! these will come in handy for my bunco gifts! I love your lanterns they are the cutest and they have character! So much more fun than the store bought ones that everyone else has. Well done. That idea is open to so many options too! I just love this! You could also use battery operated candles, I love those things. Hey, thanks for visiting my site the other day:) Hopping over to the Pinterest board now. I may have to clean out the jar box at the thrift store today!